There are certain things that I'm very slowly learning to do better. Photography is definitely up there on the list and cooking more interesting/healthier food is there too. At the top of the (not school related) list though, is learning how to photograph food. I've always had issues with this since I used to only really cook at night and there was rarely any food leftover the next day to photograph. However, with our switch to trying to eat our biggest meal for lunch, I've been cooking more in the morning or early afternoon. This has lent itself to me also trying to improve my food pictures and I must say the whole "natural light is your friend" thing really works! While we have a ton of windows in our house, it's hard to find a spot with good indirect light. Our kitchen window is one of the few places that has great light for most of the day and so it has become my best friend. Since the window is right over the sink I have to be creative, but if I place food in front of it, the pics come out a million times better. Granted, I can still screw them up (see below). 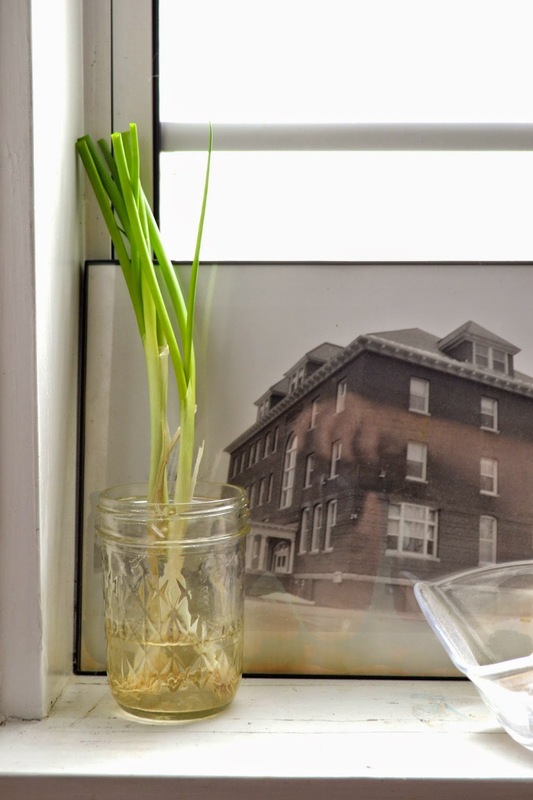 I took the picture above the day I bought green onions from the store 3 weeks ago. In my opinion, the pic came out pretty good (especially if you compare some of my old food pics... on second thought, just don't). If we stick the onions in the fridge they last under a week before they are limp and gross. BUT, if we plop them into a mason jar with a little water, then they last for weeks! This is the picture I took yesterday. Obviously, we used a bunch of onions but the remainder are still going strong. What isn't so strong is this second picture. Both pics were taken from the same spot with the same settings but the first one was taken midday with the lights in the kitchen off. The second one was taken late afternoon with the kitchen lights on. No amount of editing on my part could get this second pic to look anywhere close to the first one. Retaking the pic worked though. 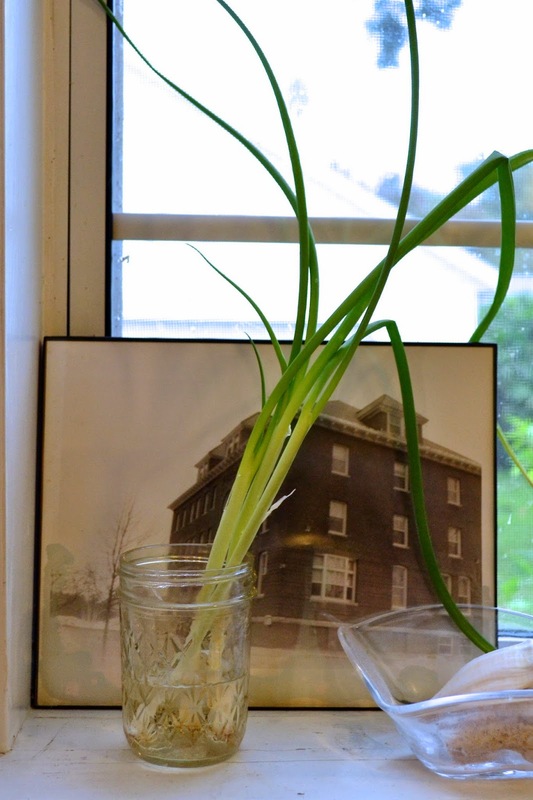 If you don't want to use the entire green onion you can also snip off the ends and they'll just keep on growing... and not flopping. Moral of the story? 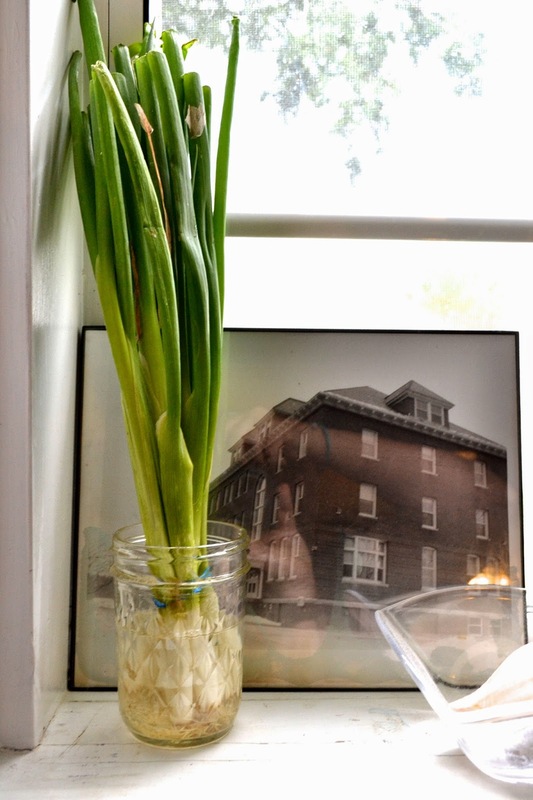 Pay attention to lighting and stick your green onions in water... seriously it takes like two seconds and it saves time and money!